Something as complex as relationships with young children actually boils down to the key ingredients you lavish into each relationship 'mixture'. As well as creating beautiful journals to help you record and reflect your teaching practices and meeting records we also love to concoct 'recipes' and quotes to provide you with nutrition and inspiration in your teaching or parenting role. See if these beautiful journals and card sets whet your appetite for heart-centred connections. Our journals are the perfect tool to help your reflection to truly become a heart task, be it as an individual or as a team. Of all our resources, these beautiful ‘Recipes for Heart Centred Teaching’ sets hold a special place in our heart. A beautiful 12 month calendar, exactly for caring people like you. A unique take on the essential mix of ingredients that go into beautiful relationships, these cards are designed to inspire. Heartfelt words paired with gorgeous photos will have you reflecting on your own practices, and striving for improvement. You’ll be able to judge your own ‘mixtures’ and tweak for missing ingredients and processes. You'll be reminded of your favourite concoctions and be able to keep them firmly on your ‘menu’. Buy all THREE sets and save! Recipes for heart centred teaching 1 & 2 plus the Toddler recipe set. This set will help you stay POSITIVE, PRESENT and PREPARED. Each set contains ten original recipes, a gourmet treat from us at The Heart School. Diverse topics provide wisdom and inspiration about children, families, teams and environments, and what is crucial to each. All the recipes will support you in infusing care, love and beauty into what you do. The recipe cards come in a display flip case. Size 125mm x 142 mm. Each set of ‘Recipes for Heart Centred Teaching’ cards creates opportunities for stunning display items, deep discussions, sparking inspiration, and reaffirming what matters most in our ECE settings. 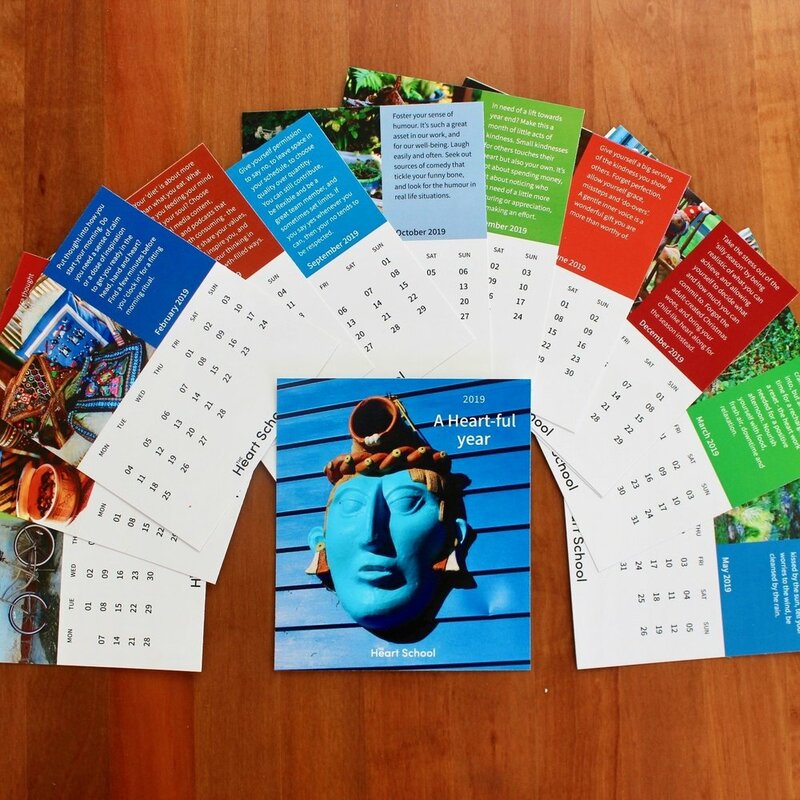 Created for visual impact, but more importantly, a heart impact, these ten card sets will become a loved treasure. They'll keep your sense of purpose, and passion alive as you craft your teaching into a work of heart. Are you looking for inspiration for making 2019 a heart-centred year? Would you like regular doses of genuine ideas to keep you motivated, and your programme meaningful? We've created ‘A Heart-ful Year’, a beautiful 12 month calendar, exactly for caring people like you. We know you want to keep the heart at the centre of your practice, but sometimes need reminders to keep these things ‘on top’. It's easy to get swept up in the busyness of the days, and let your intentional year slip away. ‘A Heart-ful Year’ will keep you on track. Its stunning design makes it a feast for the eyes, but the messages in it, and the action it prompts, will feed the heart and soul. This 14 cards, 12 months set comes in a display flip case. Size 125mm x 142mm. Each month has a relevant focus, with heart-filled ideas to infuse your practice. You'll find inspiration for strengthening and authenticating your teaching and interactions with the children. ‘A Heart-ful Year’ will help keep your fire burning from January - December, excited to observe and embrace your teaching practice throughout the year. At the end of the year, instead of wondering, “where did that year go”, you'll have 12 months of memories firmly stored in the heart bank. Our beautiful Heart Journals are the perfect tool to help your reflection as an individual or as a team to truly become a heart task. We can go on courses, and read books but the deepest learning comes from when we examine OURSELVES - what are we doing, why, and what are some alternatives. These journals can be useful for centre reviews, appraisal or registration requirements, but ideally it means far more than that. It provides you or your team with just the opportunity to learn more about yourself and your practice, and grow alongside the children in your care, so you don't only teach, you also learn! Our ‘Meetings with Heart Journal’ provides a great framework for team collaboration. It is not for one person to fill in, but a space for multiple voices, distributed roles, and full team contribution, elevating your heart meetings even further. It is designed to be useable, useful, and still able to reflect the unique vibe of your team. 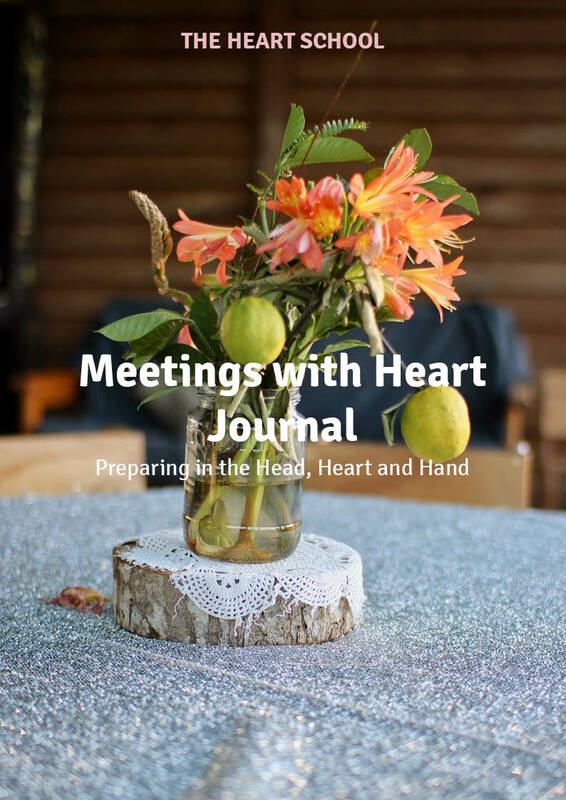 This meetings journal travels the year with your centre, setting and sharing the seen and unseen aspects of your team’s heart meetings. It comes with a wall Heart planner and is a great tool for your team’s unique journey. The journal contains 96 pages, A4, 12 months and can be implemented any month of the year and any year. Each month has space for tasks, focus, quotes, stories, ideas, and standards, as well as a year overview for planning purposes. Why, you might ask, aren't we already busy enough as is? You sure are! But we all know teaching isn’t a static profession. We’re signing up for a career full of learning, growth and change. Our reflective journal has been created for you with this in mind. It will guide you through a weekly serving of thoughtful reflection. It recognises the importance of choice, and being free to express yourself your way. Your journey is YOU-nique and your journal will be too. This 152 pages A5 journal contains one page per week of inspirational teaching quotes and one page per week for reflection note taking. Make this year the most reflective yet! Buy the Meetings with Heart Journal and the Reflection Journal as a bundle of two and save.